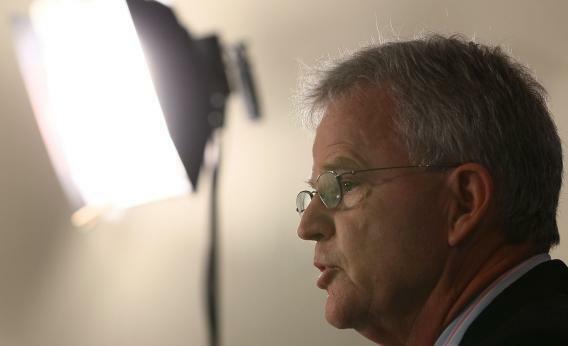 Presidential hopeful Buddy Roemer ended his reform-minded campaign this morning. Hi all, I just want to quickly introduce myself. My name is Krystal Bonner, and I’m Slate’s summer politics intern. How many Slate-sters does it take to fill the hole left by Dave’s Fresca absence? Three so far. Though Buddy Roemer suggested that the Roementum (a term coined by Weigel, of course) would continue to surge on even after Americans Elect folded earlier this month, the White House hopeful announced this morning that he is no longer a candidate for president. “After 17 months of a wonderful campaign, the lack of ballot access in all 50 states makes the quest impossible for now,” Roemer wrote on his blog. “We accepted no contributions above $100. We accepted no PAC money, no Super PAC money, no corporate money, and no lobbyist money.” In addition to ballot access, Roemer also blamed his lack of invites to GOP debates for his demise. The announcement was somewhat unfortunate timing for Mother Jones, which just published a profile of the former Democratic Louisiana governor, turned rogue GOP presidential candidate, turned Americans Elect hopeful, turned independent. Yet, Roemer does have a signature issue that was also one of Nader’s: campaign finance reform. But with the economy still struggling, it is just not that important an issue to voters. A recent Washington Post/ABC News poll on May 22 showed that only 4% of voters think “ethics/honesty/corruption in government” is the single most important issue in their choice for president. An earlier January 2012 poll by Pew Research Center likewise showed that campaign finance is one of the lowest ranked issues in both parties and is considered the second to last policy priority by voters in a list of 22 issues. Despite Roemer’s social media prowess, his campaign never received major attention from the Occupy-curious voters he was looking to attract.